Excitement, Resentment, Disaster, Genius, Resurrection. Within the archives of the Whyte Museum of the Canadian Rockies in Banff, Alberta, are a collection of news clippings from the Banff Crag & Canyon, which offer a glimpse into the attitude of the local residence toward the decisions of the Canadian Government and the Banff Pavilion. Although Alberta did not join the Canadian Federation until 1904, a key to Banff's growth was British Columbia and the Canadian Pacific Railroad. In July of 1871, British Columbia became the fifth Province to join the Canadian Federation with the promise that the Canadian government would construct a national railway, joining it with the Eastern Provinces. The railway finally passes through the Banff area in 1883. That same year hot springs are discovered in Banff on Sulfur Mountain and railroad workers staked a claim. A year later in 1884, Lord Steven, a former Canadian Pacific Railroad director, christened the area "Banff" after his birthplace, Banffshire in Scotland. In 1885 the Canadian government set aside a reserve in the Banff area. Two years later it established the Rocky Mountain Park, Canada's first National Park (it was not until 1930 that it was renamed the Banff National Park). To encouraged tourism in the area, the Canadian Pacific Railway built the Banff Hot Springs Hotel in 1888, promoted as an international resort and spa. As the area grew as a tourist destination, so did the town of Banff. Support also came from the Canadian Government, and in 1911, Ottawa commissioned a "Park Shelter" in Banff. Looking back, in 1911 Banff was approximately 2500 miles by rail from the Capital of Canada. The nation was expanding westward. The Banff/Calgary Coach Road opened, allowing automobile access. The nation was expanding. Pushing westward. Their desire was to support tourism. A pavilion that would represent all the Canadian Nation was. A note of interest was the cost. $20,000. Just seven years earlier, a building of comparable size and design, the River Forest Tennis Club (1906) was built at a cost of only $3,000. Rustic beams, art glass windows, massive fireplaces. Wright exceeded their expectations. "Recreation Building. The sealed tenders for the new recreation building to be erected on the south side of the river have been sent to Ottawa, where the decision awarding the contract will be made. 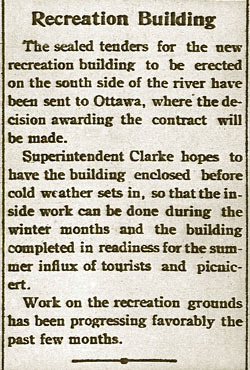 Superintendent Clarke hopes to have the building enclosed before cold weather sets in... Work on the recreation grounds has been progressing..." October 11, 1913. Excitement builds. Bids have been awarded. Jobs are opening up. One week later it is reported that: "Work is Started - On the New $20,000 Recreation Building. Preliminary work was started... The structure will be of rustic frame, one storey in height, with cement and rubble foundation. The outside dimension will be 50x200 feet... The contract has been awarded to Bennett, Debman & Co., of Calgary, and calls for the completion of the building by the first of May..." October 18, 1913. Enthusiasm wanes as resentment sets in. "It is true a recreation building is now under construction... but the building is only suitable for a very few summer sports, picnicers’ lounging place and drinking of afternoon tea, during four months of the year... The original plans, as outlined by men who would use the building as outlined by men who would use the building and presumably know something of what was required, called for a building containing accommodations for curling, hockey and all kinds of winter sports, and would have cost very little if any more than the one now under construction. 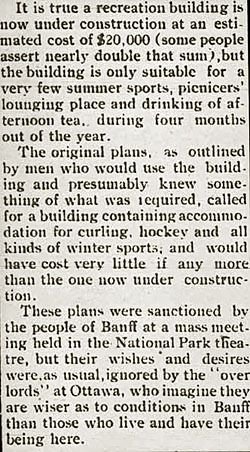 These plans were sanctioned by the people of Banff at a mass meeting held in the National Park theater, but their wishes and desires were, as usual, ignored by the 'over lords' at Ottawa, who imagine they are wiser as to conditions in Banff than those who live and have their being here." December 6, 1913. Ottawa held the purse strings. "Banff Improvements. Sup’t Clarke went down to Calgary on Monday night and all the city papers, Tuesday, contained articles on ‘Improvements Projected at Banff’... Just what use the government will make of the pavilion erected at the recreation grounds last winter... neglected to inform the press of Calgary... Crag and Canyon has contended that the present building was utterly useless and the money used in construction wasted..." June 13, 1914. Disaster. 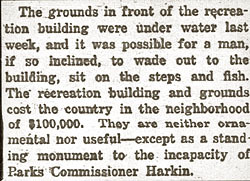 "The grounds in front of the recreation building were under water last week, and it was possible for a man, if so inclined, to wade out to the building, sit on the steps and fish... They are neither ornamental nor useful except as a standing monument to the incapacity of Parks Commissioner Harkin." July 10, 1920. Genius. 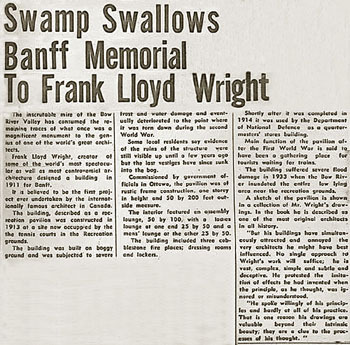 One never appreciates what one has until it is gone... "Swamp Swallows Banff Memorial to Frank Lloyd Wright. The inscrutable mire of the Bow River Valley has consumed the remaining traces of what once was a magnificent monument to the genius of one of the world’s greatest architect... The building was built on boggy ground and was subject to severe frost and water damage and eventually deteriorated to the point where it was torn down during the second World War..." December 16, 1964. Resurrection. 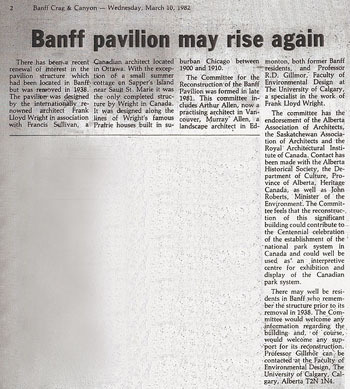 "Banff pavilion may rise again. There has been a recent renewal of interest in the pavilion structure which had been located in Banff but was removed in 1938... The committee for the Reconstruction of the Banff Pavilion was formed in late 1981." March 10, 1982. Text by Douglas M. Steiner, Copyright 2010.